Desi Smith/Staff Photo. 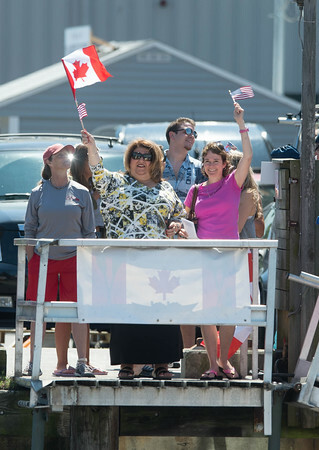 Mayor Sefatia Sefatia Romeo Theken waves the Canadian flag and Lunenburg's Mayor Rachel Bailey waves the American flag, supporting each others team before the start of the Inernational Dory Races held Saturday at the State Fish Pier. June 20,2015.